[ARTHUR ST. CLAIR]. CHARLES THOMSON. 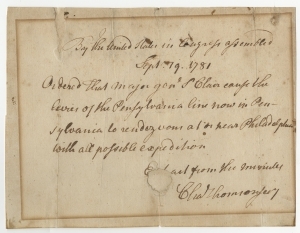 Printed Document, Manuscript Order of the Continental Congress, to Arthur St. Clair, on levying troops in Pennsylvania to organize at Philadelphia, signed by Thomson as Secretary of Congress, September 19, 1781. 1 p., 5¼ x 7¼ in. In January of 1781, the Pennsylvania militia posted near Morristown, New Jersey, rebelled against the difficult conditions at the camp and the low pay (for most, $20 for three years of service). The rebellion was successfully suppressed but left the Continental Army with a critical shortage of men from a strategically important state. On September 15, Washington wrote from Williamsburg, Virginia, with barely concealed irritation at both St. Clair, whom he ordered to march south immediately, and the Pennsylvania Assembly, whose low bounties and poor supply allowances, had made recruiting difficult: “Let it not be said that those Troops are kept from Service for Want of a few Articles which they could wish to be furnished with, when other Troops doing Duty in the Field are combatting almost every Distress imaginable, in the Want of almost every Necessary.” Washington was likely behind this order of Congress. Despite the urgency of these requests, the final detachment of St. Clair’s Pennsylvania troops did not arrive at Yorktown until October 19, 1781, the day the British surrender terms were finalized. Alexander Hamilton to Elizabeth Hamilton, ca. September 15-18, 1781. 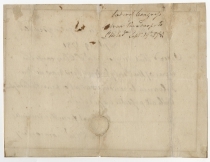 Arthur St. Clair to George Washington, July 20, 1781; George Washington to Arthur St. Clair, August 22, 1781. 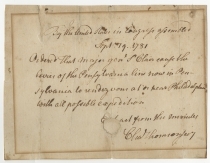 George Washington to Arthur St. Clair, September 15, 1781.